Movement for the Emancipation of the Niger Delta has declared "all-out war"
LAGOS, Nigeria (CNN) -- Nigeria's military has rescued 18 hostages held by militants in its oil-rich Niger Delta region, a military spokesman said Monday. File image shows Movement for the Emancipation of the Niger Delta fighters. The first group -- nine Filipinos and five Nigerians -- were released on Saturday, while four Ukrainians were released on Sunday, according to Col. Rabe Abubakar, spokesman for the Nigerian military's joint task force. Nigeria's military began clearing the western Niger Delta region last week, its first major operation against the Movement for the Emancipation of the Niger Delta, an armed militant group that demands a better distribution of the country's oil wealth. Both the Nigerian military and the militants have said the ongoing fighting has resulted in a high number of casualties. As many as 1,000 have been killed, according to Victor Burubo, a spokesman for the Ijaw National Council which represents the region's largest ethnic group. However, aid groups and journalists have been unable to verify that figure. "We want the international community to know that we are getting rid of criminals and terrorists in our communities so foreigners who come here to work and invest are safe," Abubakar said. Four villages near the militants' camps have been destroyed in the fighting, Burubo said. However, the military spokesman stressed that Nigerian forces are not targeting civilians, blaming such attacks on the militants. "We are not attacking villages -- just (militant) camps," Abubakar said. On Friday, MEND declared "an all-out war" on the government after what it said was a deadly bombing raid on civilians. 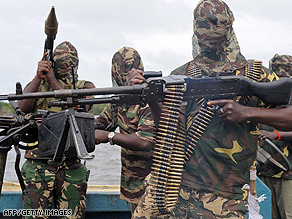 It is not the first declaration of war by MEND, which demands that more of Nigeria's oil wealth be reinvested in the region instead of enriching those the militants consider corrupt politicians. The militant group declared war against the government in September for what it said were unprovoked attacks. At that time, MEND destroyed several oil facilities, forcing Nigeria to cut its oil exports by as many as 1 million barrels of oil per day, or 40 percent. The recent violence -- which has included attacks on pipelines and hostage-taking -- has limited shipment of crude oil supplies out of Nigeria, Africa's largest producer. MEND has threatened to blockade oil vessels, and has warned oil companies in the region to leave and "cease oil production until further notice." The militant group said Friday the country's armed forces conducted "indiscriminate aerial bombardment on the defenseless civilians in the Gbaramatu area of Delta state." It said the strikes were punishment "for the humiliating defeat" of the army in raids on two militant camps Wednesday. "Casualties are mostly women, children and the elderly who could not get away quickly into the bush or high sea," the militant group said. The military says it is responding to the militants' attacks on troops, hijackings of vessels, and threats to innocents, such as the "expatriates who were given ultimatum to leave the region by the militants." It characterized the various claims by the militants as "propaganda." "We are not at war with any individuals or groups in the region," Abubakar said. "Ours is to protect lives and property and also to rid the region of criminals who hide under the guise of struggle agenda to perpetrate crime."